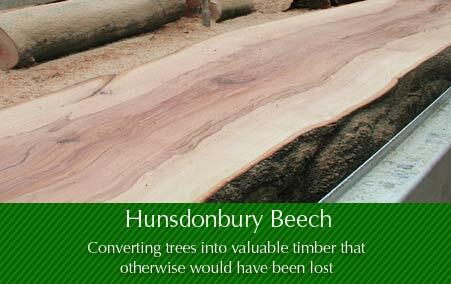 Some of the photos show how we managed to save some lovely beech timber that otherwise would now be firewood. The tree was a beautiful copper beech and some 200 year old growing in a garden in Hunsdonbury near Ware in Hertfordshire. Unfortunately this tree was in the final stages of a root decay, caused by a severe root rot fungus — Meripilus giganteus. Meripilus giganteus, also known as the Giant polypore is a common cause of the death and /or windblow of mature beech trees. 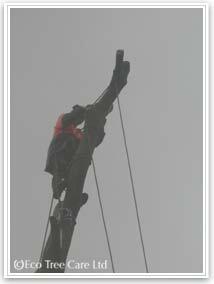 It is considered very serious and dangerous especially when in an urban environement or in areas with a high foorfall. When the fruiting body appears in late summer into autumn it is a sign that the fungus is very well established and the tree could start to become unstable if it is not so already. The more numerous the clumps of fruiting bodies generally the greater the risk, but be warned this is not always the case. Very often the affected beech tree will look to be in good health, if the crown is also thin and dying back, the risk is probably immediate. To give some balance to this explanantion it should be said that this prognosis is not clear cut and each tree and it's situation must be considered on its own individual merits. 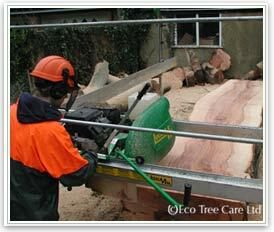 There are certain techniques that can be employed to accurately ascertain the extent of the fungal decay and the likely chance of failure such as using an 'Air-spade' which uses compressed air to excavate the roots enabling inspection. 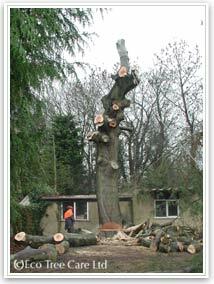 This is at the cutting edge of professional arboriculture and recent articles in arb magazines suggest that too many beech trees with Meripilus are condemned unnecessarily becasue of fear of litigation or owners not wishing to pay for procedures which may save the tree. Our final word though would probably be that if a Beech tree has Meripilus fruiting bodies, then it is well established already. It is terminal, it is not going to get better or recover. The tree will fall over eventually. It is just a question of when, it may be years it may be decades. 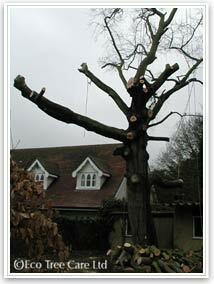 This was a prominent and beautiful copper beech tree. 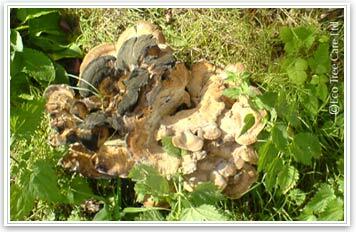 The Meripilus fungi was well established (as can be seen later from the staining within the wood of the tree). 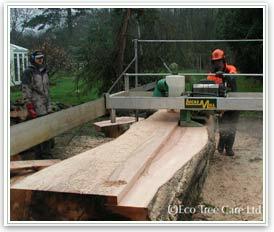 It was considered to be extremely hazardous and its proximity to nearby houses resulted in the inevitable but painful decision that it must be carefully dismantled and felled. 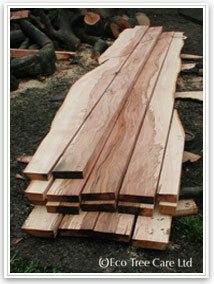 The owner asked us to salvage as much useful timber as we possibly could. 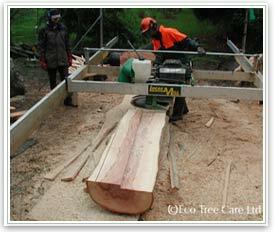 Because of its situation the only option would be to bring the sawmill to it. 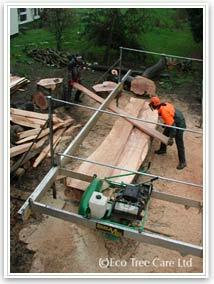 We achieved this by bringing in a portable sawmill. 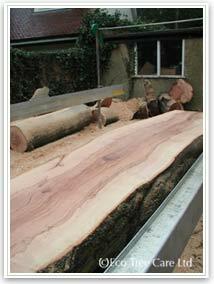 The owner did not want all the timber and so we negotiated an agreement between us for retention of the timber. The remainder would be logged for firewood. 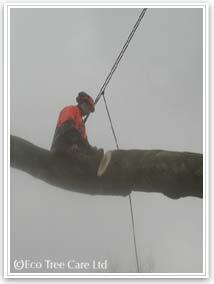 The tree was carefully dismantled over two wet winter days by our team of expert tree surgeons. 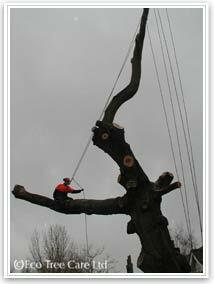 Large branches were lowered gently to the ground and cleared by the grounds team. 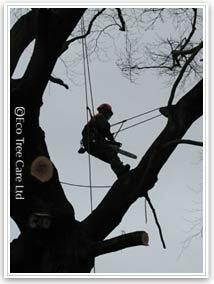 Below are some images from the days that help to lend some scale to the proceedings and the technical skill and equipment involved in such a large tree in a difficult position. 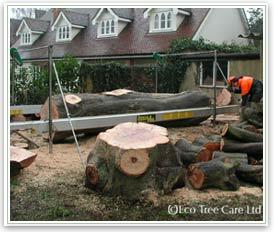 Becasue of its situation in a rear garden with a narrow access we brought in a portable sawmill which could be disassembled and reassemabled around the felled trunk. After a day of milling we were able to recover much good timber which because of the fungus had some interesting colouration and markings. The timber was stacked and barn seasoned. Much of it has been sold or converted into furniture by us over the years. We have do still have some in 2011, 8 years later. 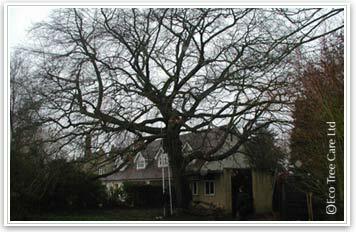 This tree continues to live on in peoples lives and homes. 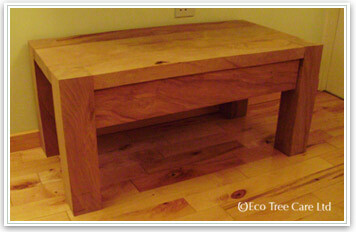 Below is just one of the pieces of furniture that has been made from this beech. 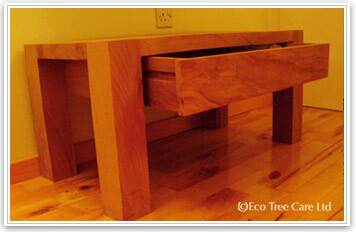 This one has been designed and made by a friend who is a furniture maker.